This is a unique translation of Usui Mikao’s memorial stone by Japanese Reiki Teacher Inamoto Hyakuten. It can be found in the research book, The Reiki Sourcebook. 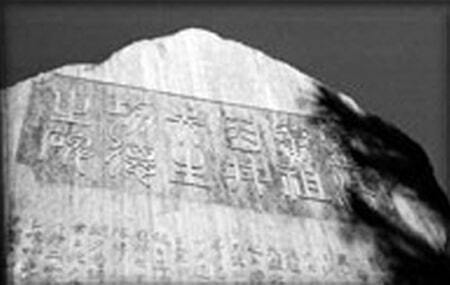 The memorial stone was erected by the Usui Reiki Ryoho Gakkai in Japan one year after Usui Mikao’s death. This translation is true to the original text and has not been modernised. Though this is the case it is also easy to read and creates a feel for the period and the happenings during Usui Mikao’s life as seen through the eyes of the society’s members. That which is attained within oneself after having accumulated the fruits of disciplined study and training is called ‘Toku’ and that which can be offered to others after having spread a path of teaching and salvation is called ‘Koh’. Only with high merits and great virtues can one be a great founding teacher. Sagacious and brilliant men of the olden time or the founders of new teachings and religious sects were all like that. Someone like Usui Sensei can be counted among them. Sensei newly founded the method based on Reiki of the universe to improve the mind and body. Having heard of his reputation all over, people crowded around to seek his teachings and treatments. Ah, how popular it is! Sensei, commonly known by the name ‘Mikao’, with an extra name ‘Gyohan’ is from Taniai-mura (village) Yamagata-gun (county), Gifu-ken (prefecture). He is descended from Chiba Tsunetane. His father’s name was Taneuji, and was commonly called Uzaemon. His mother was from the Kawai family. Later on, as the ‘dojo’ became too small, in February of the 14th year (1925 A.D.) the new suburban house was built at Nakano according to divination. Due to his respected and far-reaching reputation many people from local districts wished to invite him. Sensei, accepting the invitations, went to Kure and then to Hiroshima and Saga, and reached Fukuyama. Unexpectedly he became ill and passed away there. It was March 9 of the 15th year of Taisho (1926 A.D.), aged 62. His spouse was Suzuki, and was called Sadako. One boy and one girl were born. The boy was named Fuji and he succeeded to the family. Sensei’s personality was gentle and modest and he never behaved ostentatiously. His physique was large and sturdy. He always wore a contented smile. He was stout-hearted, tolerant and very prudent upon undertaking a task. He was by nature versatile and loved to read books. He engaged himself in history books, medical books, Buddhist scriptures, Christian scriptures and was well versed in psychology, Taoism, even in the art of divination, incantation, and physiognomy. Presumably sensei’s background in the arts and sciences afforded him nourishment for his cultivation and discipline, and it was very obvious that it was this cultivation and discipline that became the key to the creation of Reiho (Reiki Ryoho). On reflection, Reiho puts special emphasis not just on curing diseases but also on enjoying wellbeing in life with correcting the mind and making the body healthy with the use of an innate healing ability. Thus, before teaching, the’‘Ikun’ (admonition) of the Meiji Emperor should reverently be read and Five Precepts be chanted and kept in mind mornings and evenings. These are truly great teachings for cultivation and discipline that agree with those great teachings of the ancient sages and the wise. Sensei named these teachings ‘Secret Method to Invite Happiness and ‘Miraculous Medicine to Cure All Disease’; notice the outstanding features of the teachings. Furthermore, when it comes to teaching, it should be as easy and common as possible, nothing lofty. Another noted feature is that during sitting in silent meditation with Gassho and reciting the Five Precepts mornings and evenings, the pure and healthy minds can be cultivated and put into practice in one’s daily routine. This is the reason why Reiho is easily obtained by anyone. A little more than 2,000 people became students of Sensei. Those senior disciples living in Tokyo gathered at the ‘dojo’ and carried on the work (of the late Sensei) and those who lived in local districts also spread the teachings. Although Sensei is gone, Reiho should still be widely propagated in the world for a long time. Ah, how prominent and great Sensei is that he offers the teachings to people out there after having been enlightened within! Of late the fellow disciples consulted with each other about building the stone memorial in a graveyard at Saihoji Temple in Toyotama-gun so as to honor his merits and to make them immortalized and I was asked to write it. As I deeply submit to Sensei’s greatness and am happy for the very friendly teacher/disciple relationships among fellow students, I could not decline the request, and I wrote a summary in the hope that people in the future shall be reminded to look up at him in reverence.